Art by Ra Vincent ©2016 Disney Enterprises Inc. All Rights reserved. Photo ©2016 Disney Enterprises Inc. All Rights reserved. 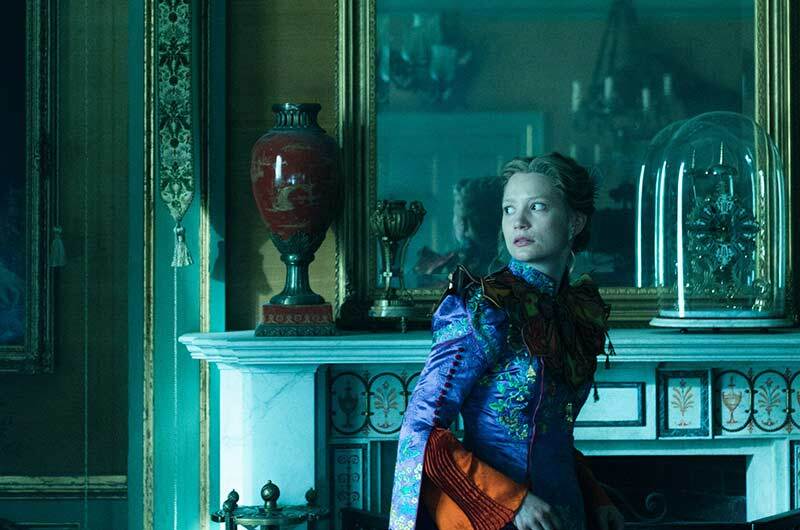 Mia Wasikowska. Photo ©2016 Disney Enterprises Inc. All Rights reserved. Photo by Peter Mountain ©2016 Disney Enterprises Inc. All Rights reserved. 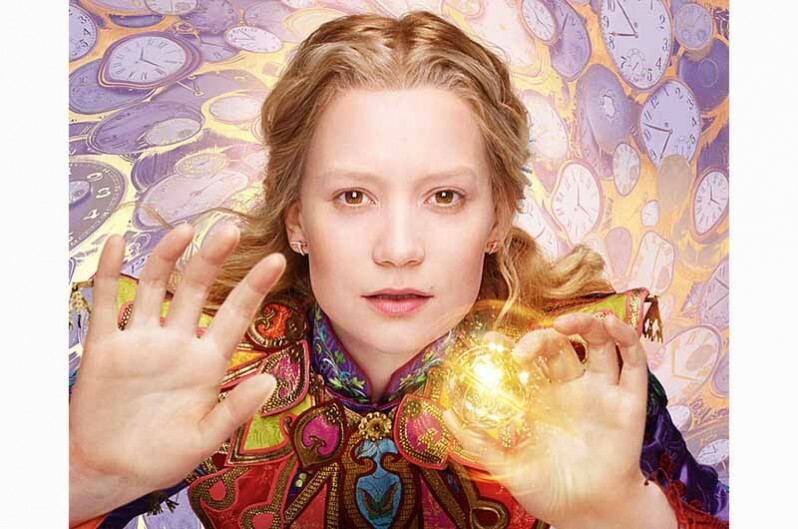 Mia Wasikowska. Poster image ©2016 Disney Enterprises Inc. All Rights reserved. 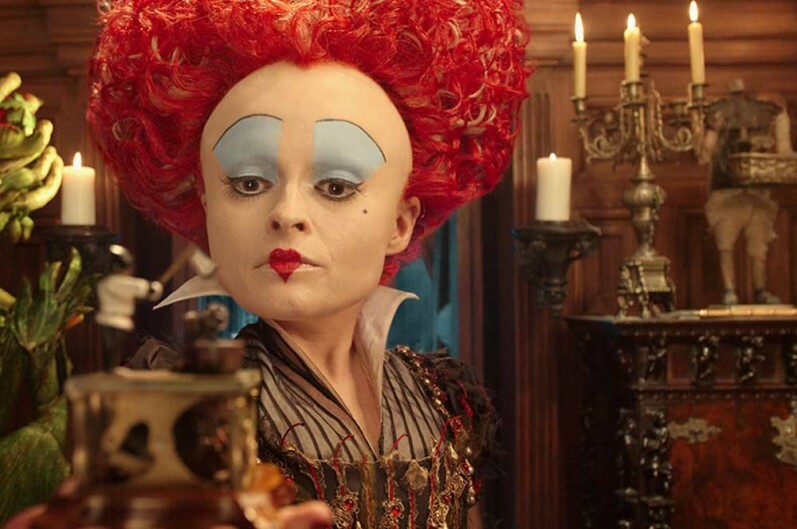 The Red Queen [Helena Bonham Carter] observes the gift from Time, a performing music box which shows an executioner cutting off someone’s head! “You cannot change the past. It always was. It always will be. Although I dare say, you might learn something from it…". the Oceans of Time to escape the Red Queen and save the Hatter…and everyone else…before time runs out. 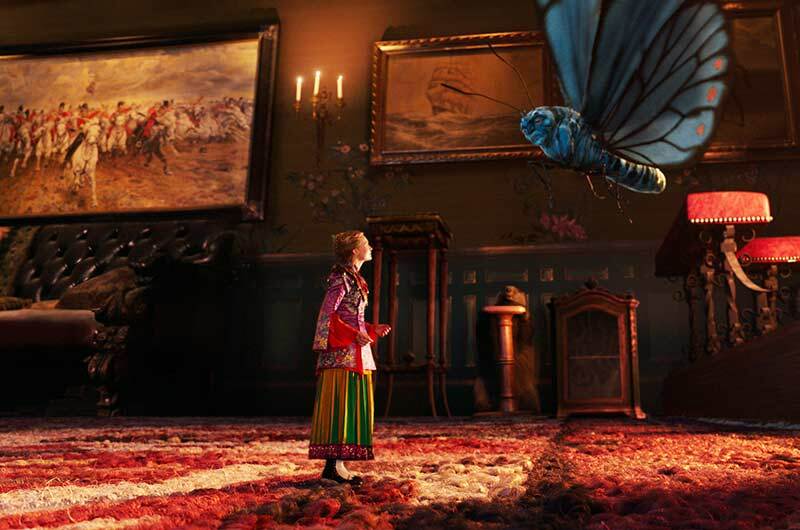 Production Designer Dan Hennah and Set Decorator Ra Vincent SDSA leapt into Wonderland early on, designing the concept art for the sequel to Producer Tim Burton’s ALICE IN WONDERLAND. 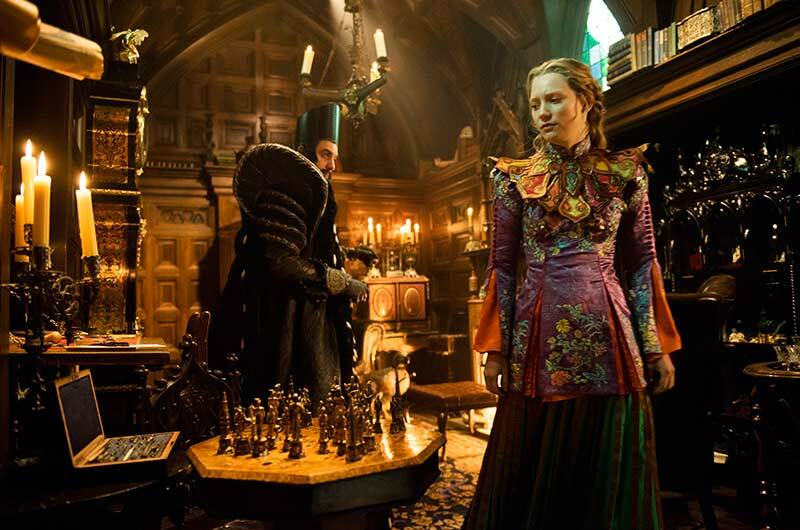 Collaborating with Set Decorator Anna Linch-Robinson, they brought about the sets for Director James Bobbin’s step from Alice’s Victorian London through the Looking Glass into the fantastical world of Underland. 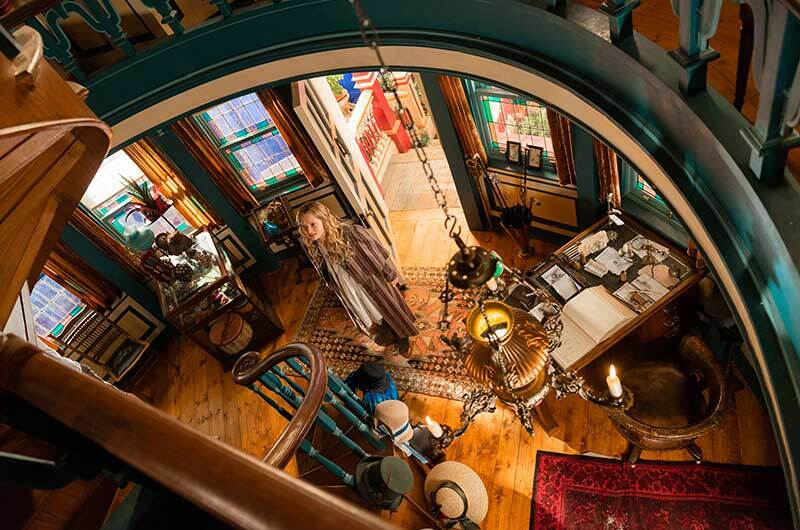 SET DECOR: You and Anna Lynch-Robinson were the set decorators on this film – how did you go about this…i.e. split the duties, who did what, what was your method? 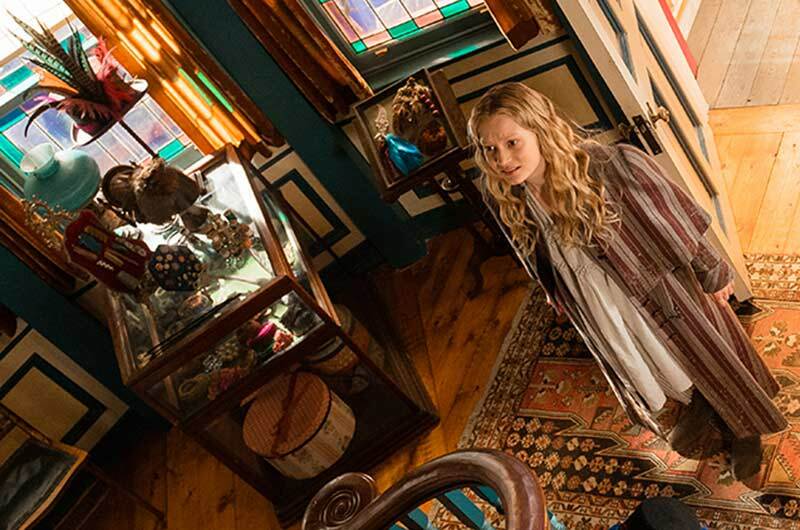 Set Decorator Ra Vincent SDSA: Anna and I had a great partnership here—she brought a local knowledge and an already established crew and working process to the project, while I had early involvement in the development of the ‘look’ with Production Designer Dan Hennah and Director James Bobbin. This included setting up the palette of the film, prop and concept design, and establishing aesthetic rules for our worlds. 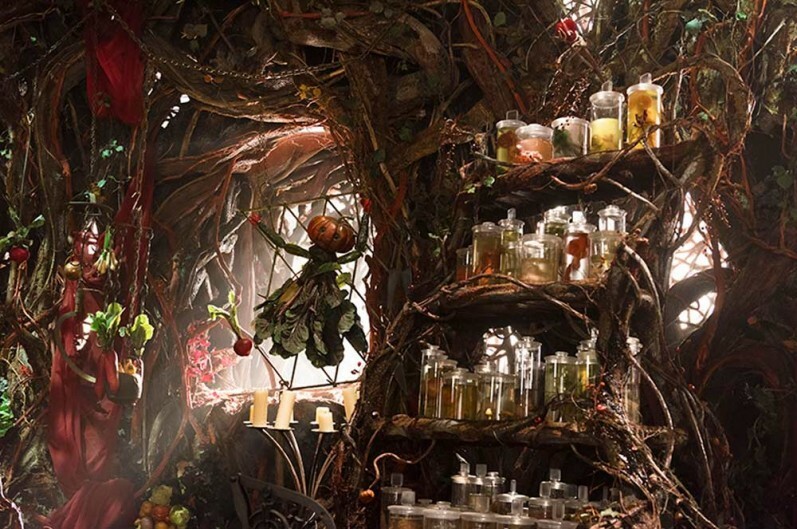 SET DECOR: Since you came on very early in production to do concept drawings for the sets and key elements, did you go on to be responsible for the decoration of those same sets, or did you hand some or all of them over to Anna and her team? RV: In the process of designing and dressing fantastical set environments there is always a sharing of ideas…Anna and her team would interpret the concept art and try to come as close as possible to the intended look while introducing wonderful new ideas, and we would share the decisions and our opinions on all of our set dec builds. SET DECOR: When we talked with you about your work on THE LORD OF THE RINGS and THE HOBBIT films, we learned about the artisanal-focus of filmmaking in New Zealand. This movie was filmed in the UK, with the same production designer, the inimitable Dan Hennah, but with different crews and methods for set decoration and dressing. Could you tell us about this? 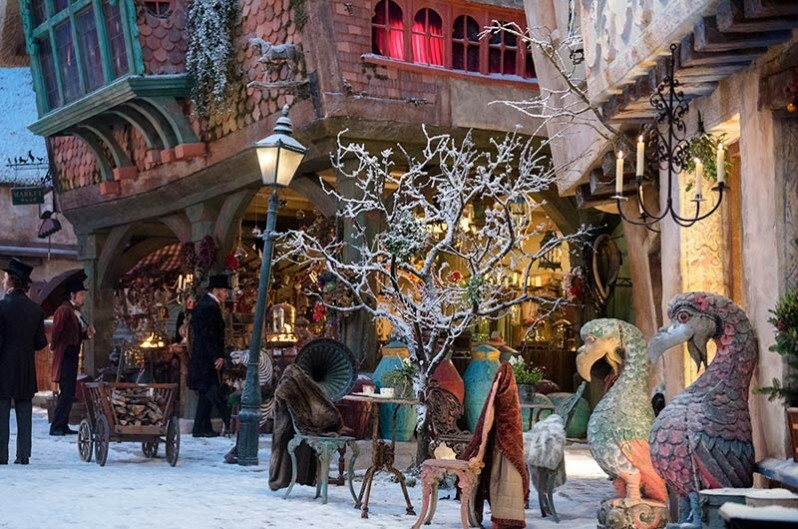 RV: England was an exciting place to make a semi-period film, the prop houses are arguably the biggest and most well stocked of anywhere in the world. We had every opportunity to be bold with our Victorian decoration and it always looked good. This differs from working in a country like New Zealand where we have little or no access to good antique furniture and prop houses, so you rely on all of those different technicians to help build wonderful set dressing elements, which is both liberating because you can make exactly what you want, and confining creatively because having access to a good prop house can broaden your ideas palette. 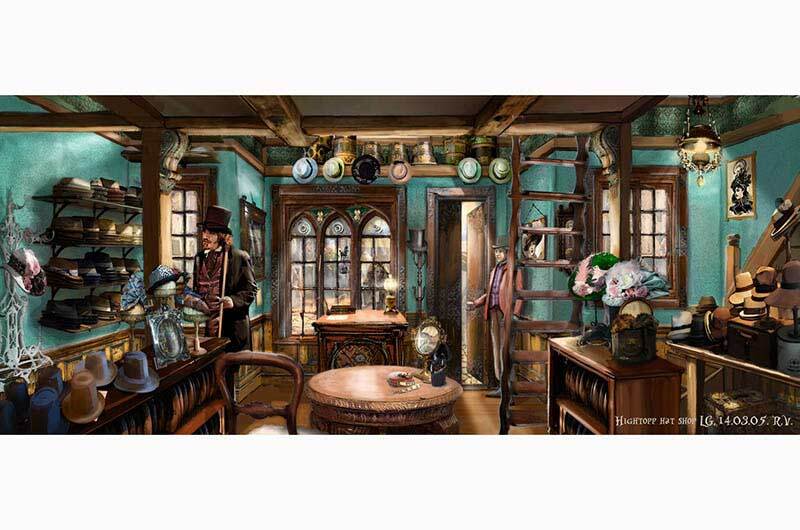 SET DECOR: We love the lineage of Hatter’s father’s Hightopp Hat Shop and the delightful Hatter’s House! RV: The Hightopps share some common colorways to tie the family line together. 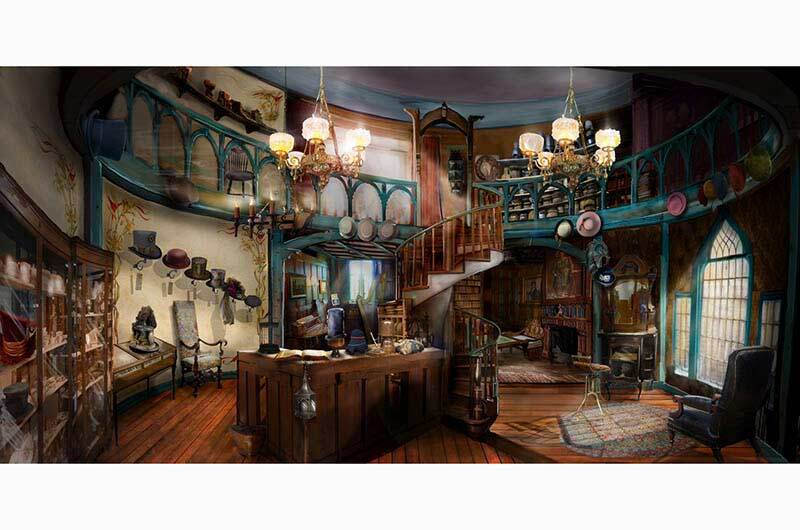 The Hatter’s House interior takes its inspiration from the hat shop where he spent his childhood working with his family. This gives his character a visual key to remind us whose environment we are visiting. RV: Time’s private chamber wanted to be small and comforting—he portrays himself as the mighty all powerful Time, but deep in his private confines, he is a little meek and unsure of himself, so something that felt like a sanctuary seemed appropriate. 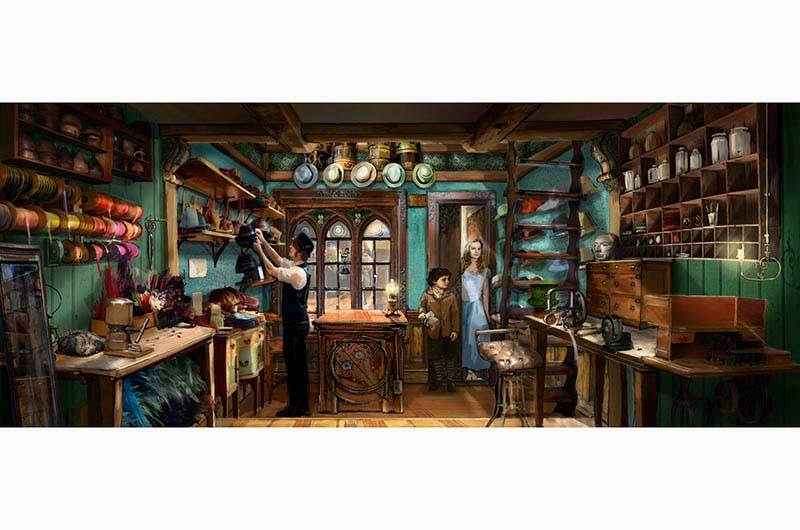 RV: We found a vast collection of clocks to dress the clock shop, I worked some ‘Times realm’ sympathetic colors into the set finish, and we made hints with stained glass colored windows as to who we would expect to see in this shop. 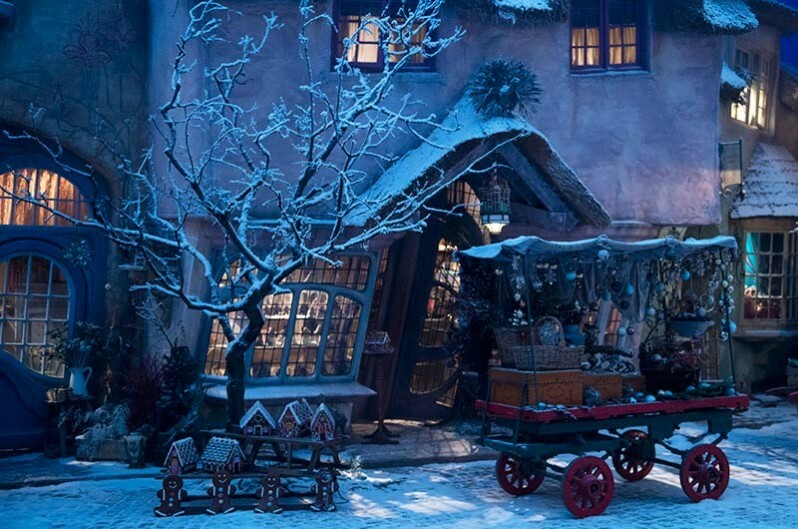 SET DECOR: How were you involved with the creation of the village square? RV: I spent most of my time for this set organizing colorways and architecture details that would work in well with the set dressing. 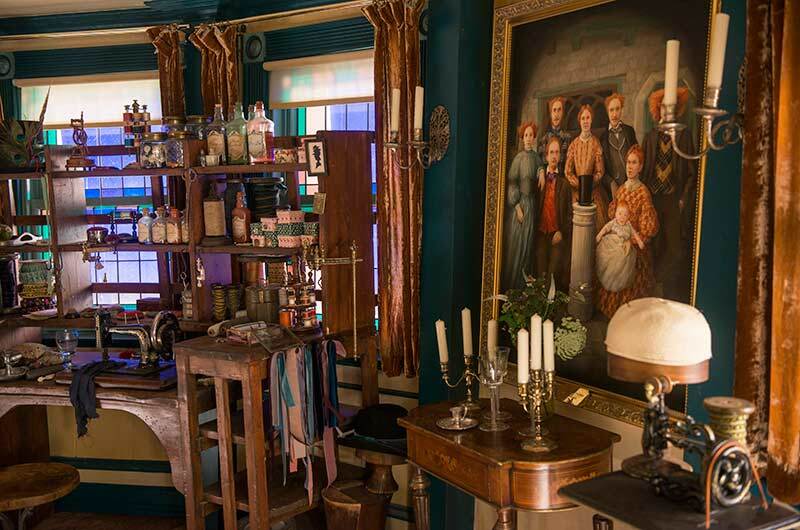 Many of the items in this massive set where bought and altered to be more whimsical and wizenedy, this involved painting bright colors and making things a little crooked on set. Please tell us about this set! RV: This is a long-forgotten room in the Ascot mansion. 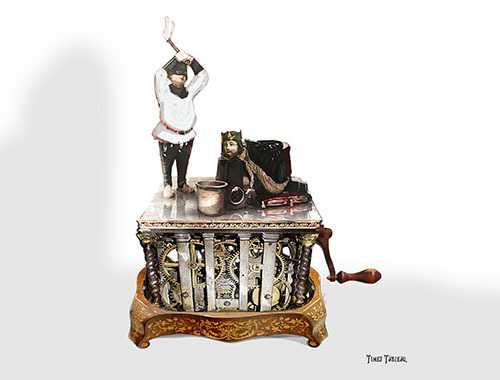 We picked particular antiques and designed key objects that later would become live characters in the scene. Alice’s path through the normal-sized set had to be well planned so that when she passed to the other side of the mirror and became tiny, she could work her way to the other side of the room. 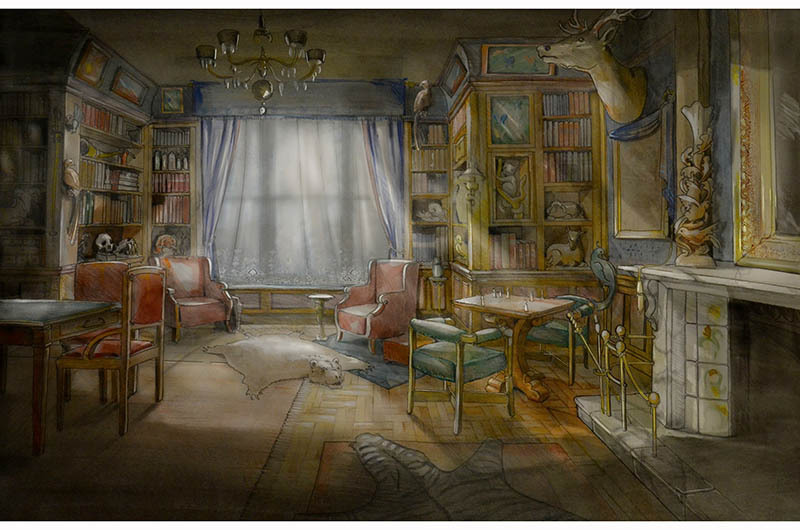 SET DECOR: Were the miniaturization scenes developed after the sets were created, or directly from the drawings? Were some of the elements physically built or were they all CG’d? 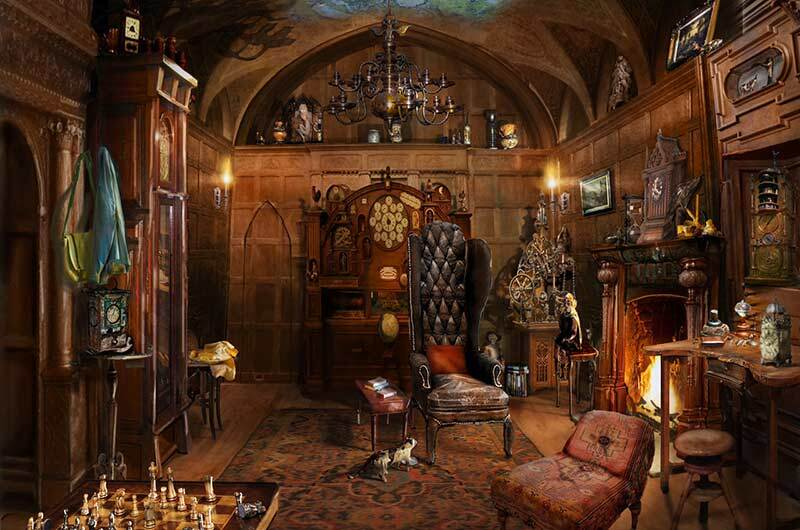 RV: The whole set was thoroughly scanned and texture mapped, and then most of the interactive elements in the room where built as huge stunt set pieces, many of which were re-created with the help of Visual Effects. 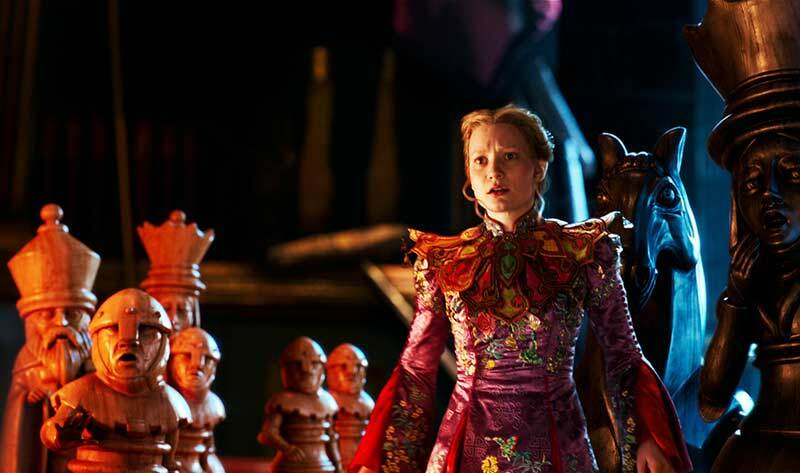 SET DECOR: Besides the wonderfully detailed sets, you also focused on conceptualizing the remarkable “mechanical” art pieces, such as the gift the Red Queen receives, a brilliantly rendered crank music box sculpture depicting a favorite phrase of hers, “Off with his[her] head!” Please tell us about this! RV: Fortunately, we had access to some very clever prop makers, and in an effort to keep the magic in the practical filmmaking, we decided to create this miniature tableau that would really work without any CG enhancement. All of the subtle movements in the gears made it a wonder to watch…However, because of this, we could only build one working version. SET DECOR: And from small to expandable – the incredible Chronosphere! 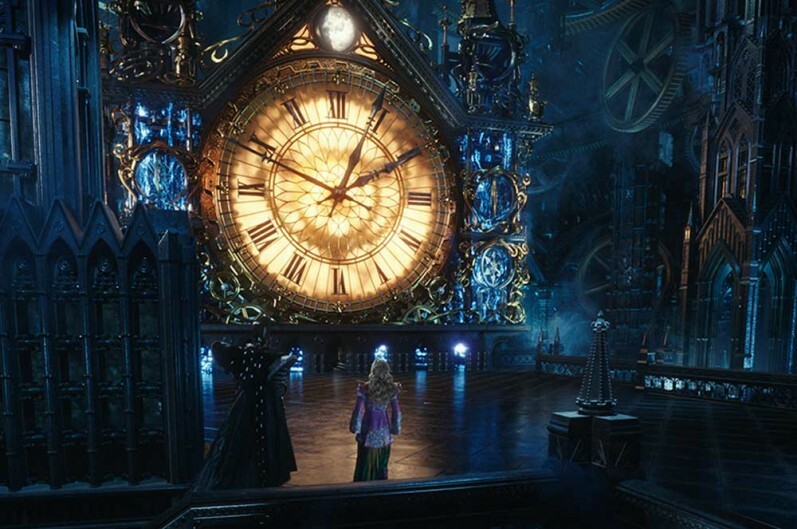 We know that Time is the keeper of the Chronosphere, the glowing, spinning, intricate, golden sphere inside the chamber of the Grand Clock that powers all time. 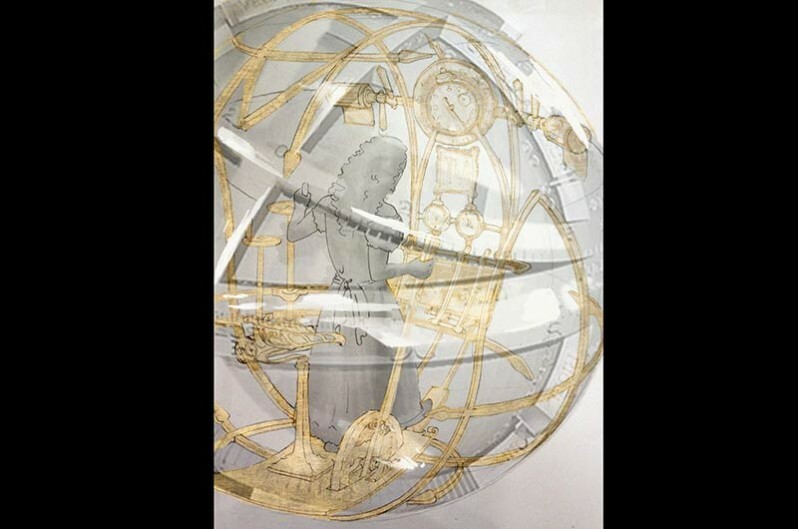 If removed from the clock, the Chronosphere allows its bearer to travel the Oceans of Time to the past…a most beautiful conveyance through time! What can you tell us of this? 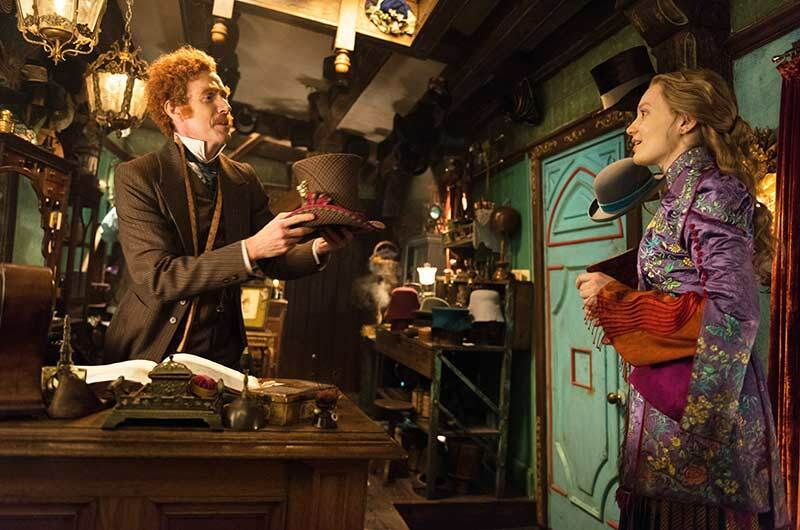 RV: We needed to find a comfortable balance between a Victorian invention and a magical machine. The risk here was always going to be a chance we would end up with a copy of H. G. Wells’s Time Machine, but Dan and James kept digging for original looks and we eventually came back to something that was a mystery but had a logic and beauty that made it feel real. 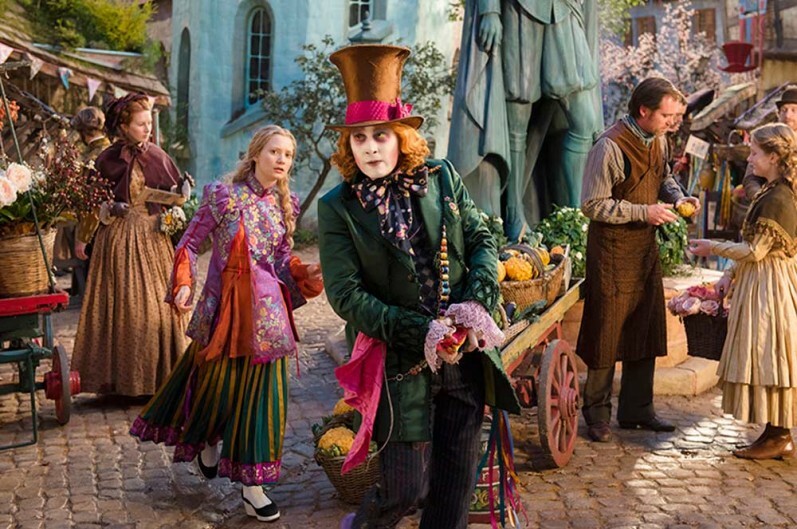 SET DECOR: Time used another transport when searching for Alice. Were you involved in the conceptualization of that as well? RV: Time’s makeshift device was created with a very method set decorating approach. I went to a series of junkyards across London and assembled a pile of objects that roughly resembled my illustration. And then, with the help of several props makers and clever swing gang/set dressers, we put all of these pieces together as you would if you had little in the way of time or materials, as is Time’s problem when he creates it in the film. 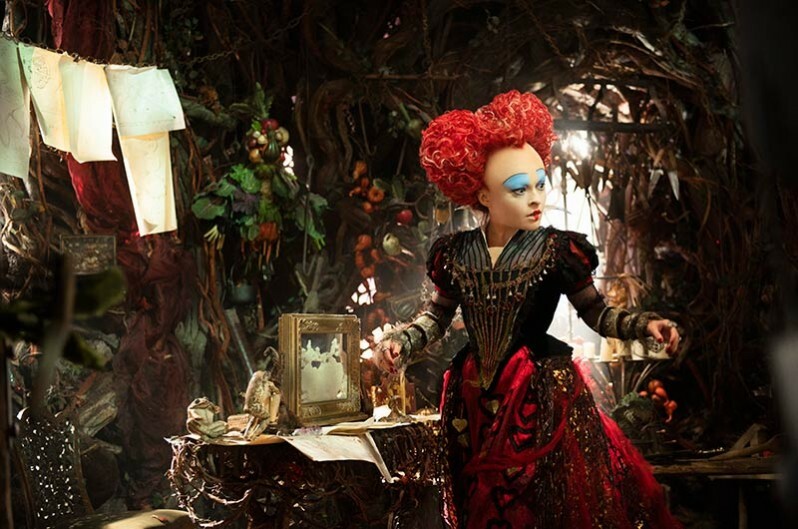 SET DECOR: How much were you involved with the creation of the Red Queen’s vined lair? RV: Set Dec on this film also ran the Greens department, and we had a great team of ‘makers’ in this department…and the team that built the Red Queen’s castle also built the furniture inside of it. So the tables and chairs where basically grown from the architecture.